In 2010 the U.S. Department of Education awarded the SSEC a five-year Investing in Innovation (i3) validation grant to evaluate the LASER model’s efficacy in systemically transforming science education. Seven school districts in North Carolina comprised 35.2% of the resulting study population. So what is LASER i3? 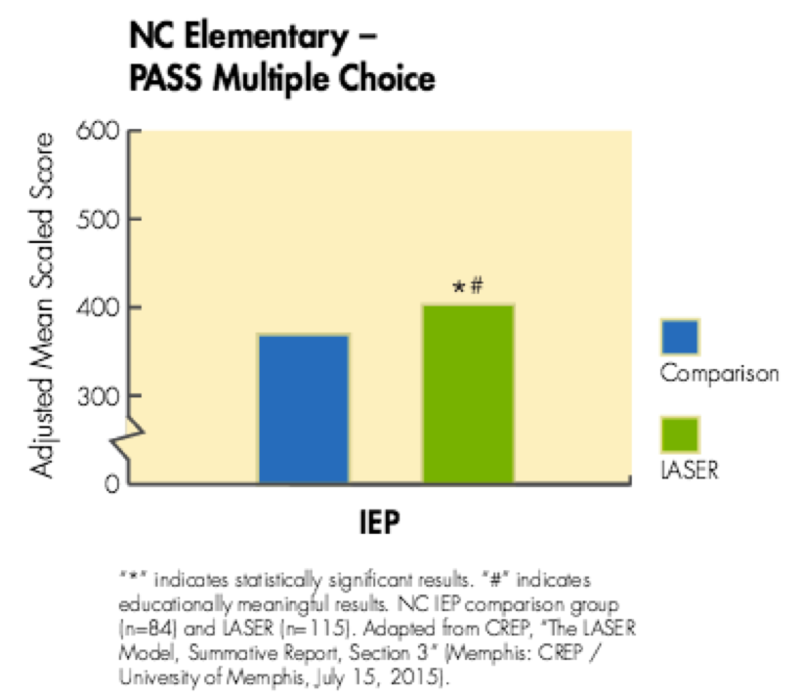 “LASER i3” refers to a study conducted by evaluators from the Center for Research in Educational Policy (CREP) at the University of Memphis on student performance at schools implementing the LASER model (Fig. 1). 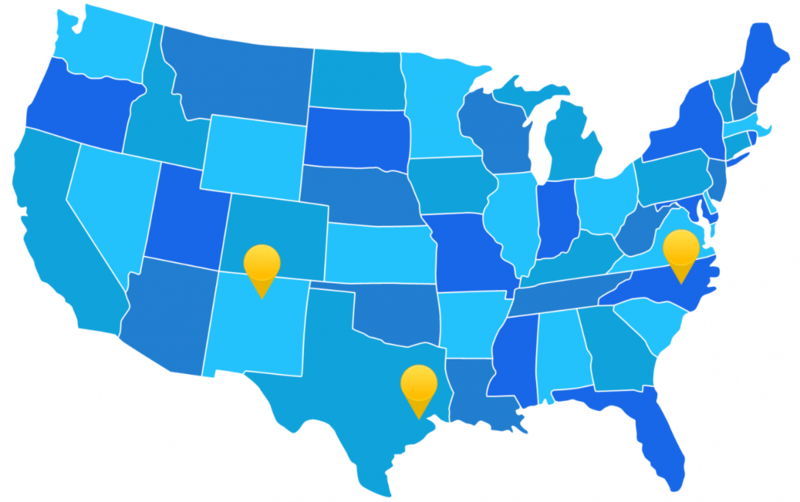 Over three years CREP studied approximately 60,000 students and assessed the impact of the SSEC’s products and services on a subsample of more than 9,000 elementary and middle school students in (1) the Houston Independent School District (HISD), (2) eight school districts in northern New Mexico, and (3) seven school districts in North Carolina. They found that the inquiry-based science promoted by the LASER model improved achievement not only in science, but also in reading and math. LASER plays a critical role in bolstering student learning, especially among underserved populations including children who are economically disadvantaged, require special education, or are English language learners. Fig. 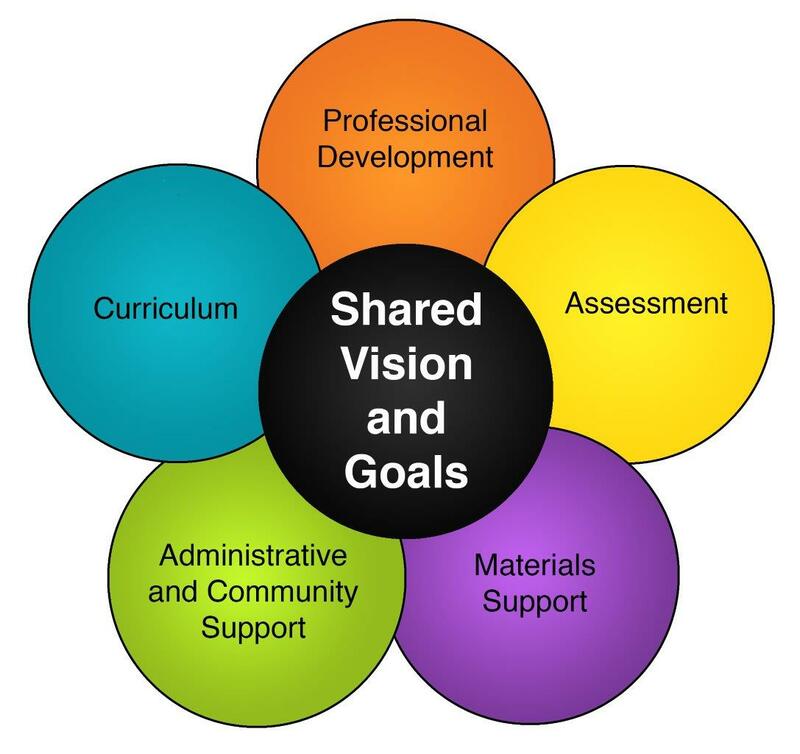 1 The SSEC’s LASER model describes five elements, which when planned around a shared vision for science, form the infrastructure to sustain student-centered learning and teaching. 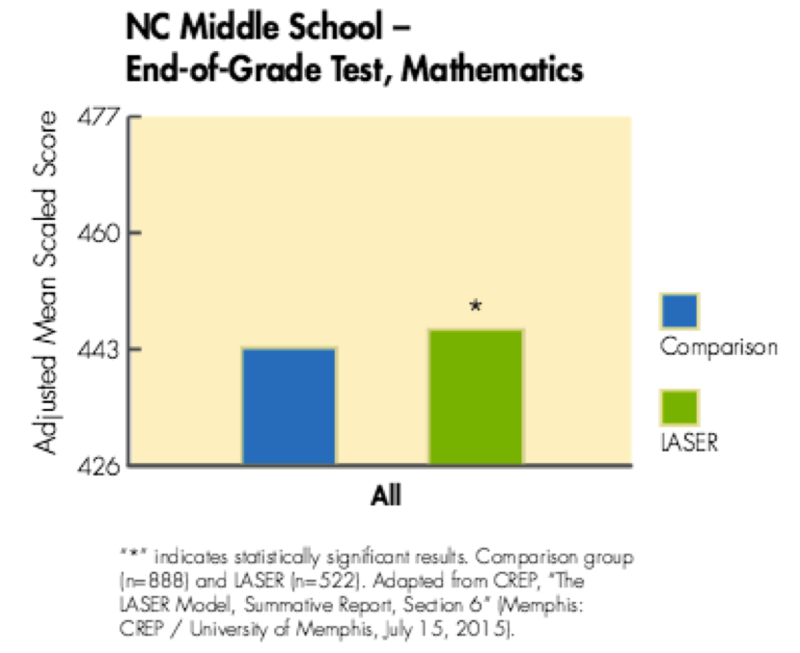 What do student assessments tell us about LASER i3 outcomes in North Carolina? The LASER i3 study resulted in many statistically significant and educationally meaningful improvements in science as well as in mathematics in North Carolina. Elementary school students with individualized education programs (IEPs) showed the greatest growth on the Partnership for the Assessment of Standards-Based Science (PASS) multiple choice test, for example. Furthermore, at middle school all LASER students measured statistically significant improvements on the end-of-grade (EOG) test in mathematics (at right). Midway through the study these results were so promising that the SSEC and CREP applied for and were awarded an evaluation continuation through 2018 from the U.S. Department of Education. This extension will enable CREP to study the long-term impact of the LASER model in North Carolina. By following the trajectory of inquiry-based instruction in participating schools after the supports of the original i3 grant are removed, CREP will be able to inform the SSEC's strategic efforts to scale this and other initiatives. “Statistical significance” refers to the likelihood that an outcome can be attributed to a specific cause (i.e., improved student achievement due to the LASER model). “Educationally meaningful” signifies the magnitude of difference between two measures (i.e., the LASER and comparison groups) has practical significance. "The staff love the PD"
What does the future hold for LASER i3? The LASER i3 study demonstrates that inquiry science improves student achievement not only in science but also in reading and math for students of all abilities at elementary and middle school. 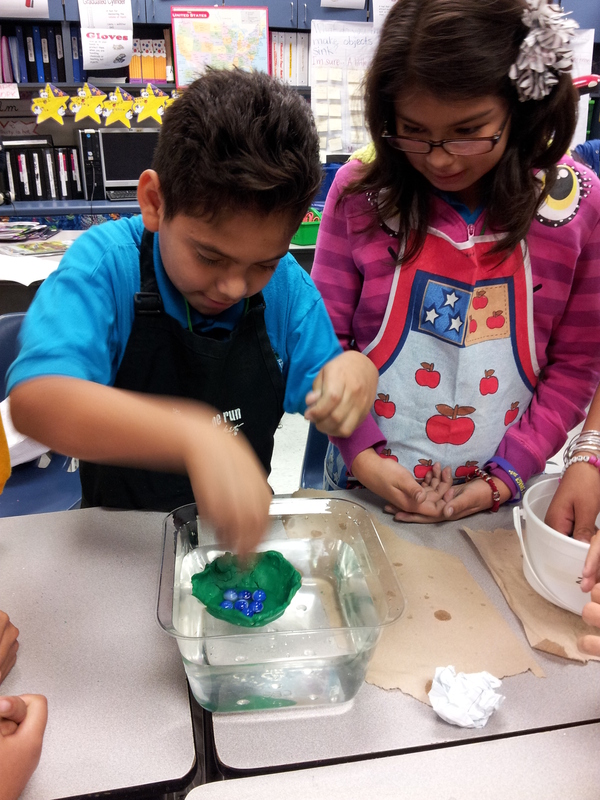 We know inquiry science programs supported by the LASER model play a critical role in bolstering student learning in science, reading, and math among all students and especially among English language learners, the economically disadvantaged, and students receiving special education. Students are learning science and loving it, thanks to the legacy of LASER i3 and the LASER model’s five elements: a research based-inquiry-centered curriculum; differentiated professional development; administrative and community support; materials support; and state and local assessments to measure the impact on student learning. Armed with this validation, the SSEC will continue its efforts to transform science education and support the LASER i3 regions as they sustain and scale the great work that has already been done. Alberg, M. (2015). 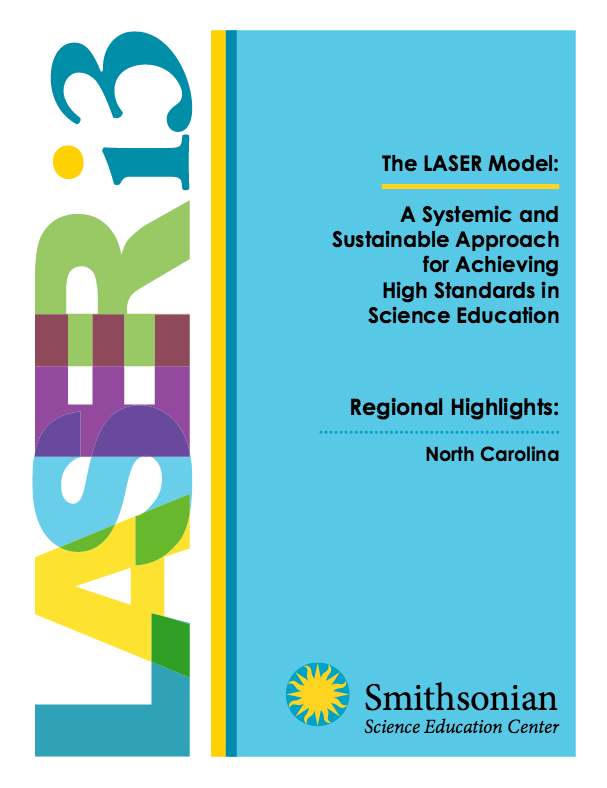 The LASER Model: A Systemic and Sustainable Approach for Achieving High Standards in Science Education, Summative Report. Memphis, TN: The University of Memphis, Center for Research in Educational Policy. Zoblotsky, T., Bertz, C. Gallagher, B. & Alberg, M. (2017). The LASER Model: A Systemic and Sustainable Approach for Achieving High Standards in Science Education: SSEC i3 Validation Final Report of Confirmatory and Exploratory Analyses. Memphis, TN: The University of Memphis, Center for Research in Educational Policy. Summative report prepared for Smithsonian Science Education Center, Washington, DC. This work was completed under a validation grant (U396B100097) awarded to the Smithsonian Science Education Center (SSEC), formerly the National Science Resources Center, by the U.S. Department of Education through the Investing in Innovation (i3) program. Matching private sector funding for the SSEC LASER i3 study was contributed by Los Alamos National Laboratory Foundation, Shell Oil Company, JP Morgan - National Philanthropic Trust, Golden Leaf Foundation, North Carolina GlaxoSmithKline, Carolina Biological Supply Company, Rural School & Community Trust, Noyce Foundation, DuPont, AT&T, Intel Foundation, and Teresa Bergeson. Students engage in a design challenge assessing their understanding of density and buoyancy from the SSEC's Floating and Sinking unit.